Welcome to the University of California Student Mental Health website. This site is hosted by the University of California Office of the President to share our collective efforts in meeting the mental health needs of our students. As you browse the site you will learn about our collective initiatives and partnerships throughout California. We would like to thank those who have contributed to this collection of resources, and we encourage mental health providers from the various college/university, county, and community agencies to consult these resources and utilize them as appropriate. The University of California has long recognized student mental health as an ongoing and urgent issue for higher education. In December of 2005, an oversight committee was convened to assess 1) trends in student mental health, 2) how these trends are being managed nationally and at the University of California, 3) the appropriate level of services on the campuses to address student mental health needs, and 4) whether the campuses currently have the resources to provide those appropriate services. The Committee concluded that mental health trends visible nationally were negatively affecting all UC campuses and urged the University to take action to ensure that its campuses can create healthier learning environments. The Committee’s findings were presented in the 2006 Student Mental Health Committee Final Report and outlined a three-tier model to address these issues. Current efforts are geared towards actualizing the model. Tier 1 – Responding to Critical Mental Health and Crisis Response Services. 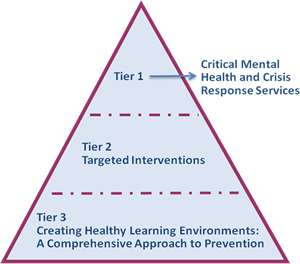 Tier 1 requires the restoration of critical mental health and crisis response service. *In 2007-08, the UC Board of Regents approved an increase in Registration Fee and earmarked $4.6 million to specifically address Tier 1-related services. Tier 2 – Targeted Interventions for Vulnerable Groups. Tier 2 requires programs that target vulnerable groups; expanded outreach, mental health internships for students, staff and faculty training, and interventions for students at high risk for alcohol and drug abuse. *A second Registration Fee increase provided additional $8 million to address tier 2. * These funds were made permanent but do not cover the steadily increasing demand for mental health services. Tier 3 – Creating Healthier Living Environments. Tier 3 requires enhancing the full spectrum of student life services towards a comprehensive approach to prevention through actively engaging faculty and academic staff, and facilitating proactive communication and collaboration among mental health stakeholders. *Proposition 63 funding has allowed the UC to begin to address this tier.